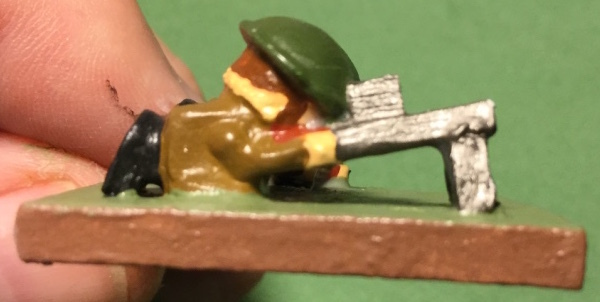 Blog reader tradgardmastare asked for some pictures on my latest build, some WWII British infantry, so that he can see the process. Sure! Here you go. Don't be put off by the number of steps. It takes more time to take the pictures and post than it does to actually execute the steps, but it is always good to do to repeat a little bit because new readers do not always go back into the blog and see the previous posts telling how, and I am always refining my process, so it does not always come out as I put out new posts. So here goes, and thanks for the suggestion tradgardmastare. The figures represented formed troops where the men stood close together. 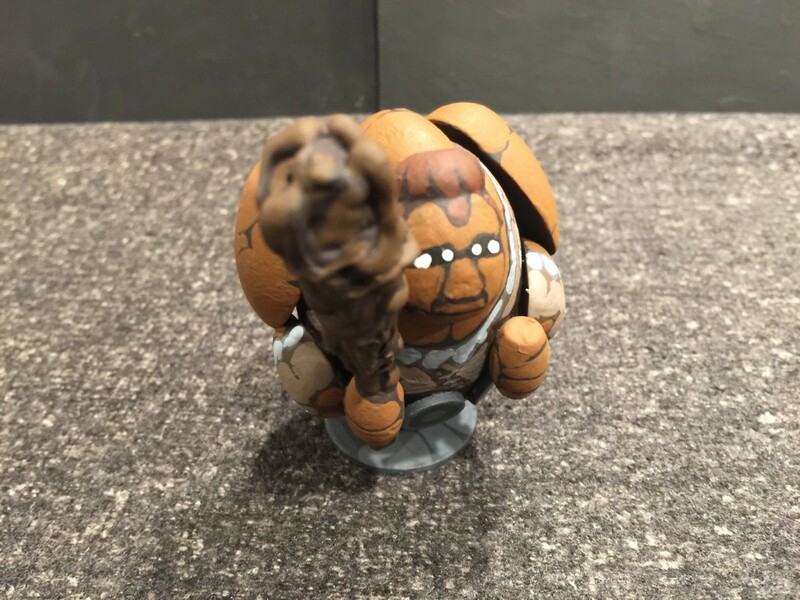 When figures are packed in, many details simply cannot be seen by the gamer, especially details on the front of the figures that are in the second and third ranks and the details on the rear of the figures that are in the first and second ranks. Painting those details is often a waste of time. 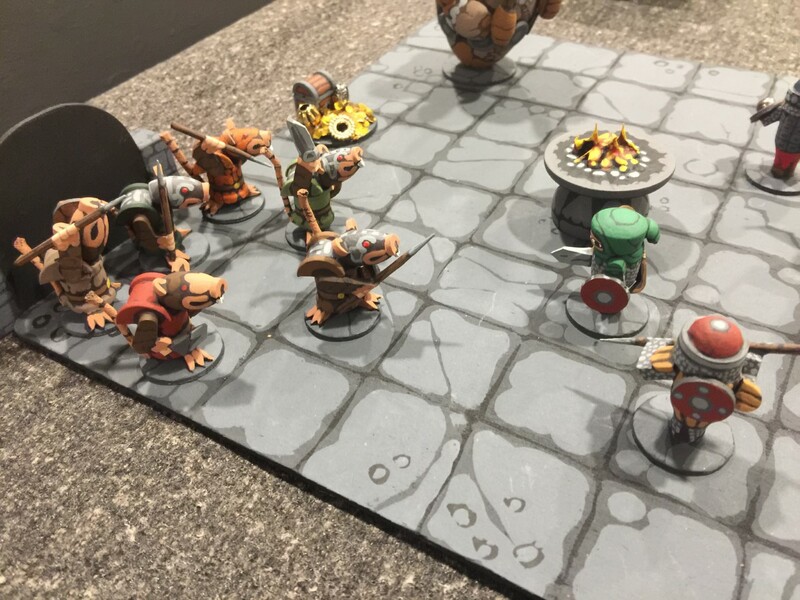 I wanted figures in specific formations on the base in order to visually represent different troop types. Handling the figures often damaged their paint jobs with hot glue. 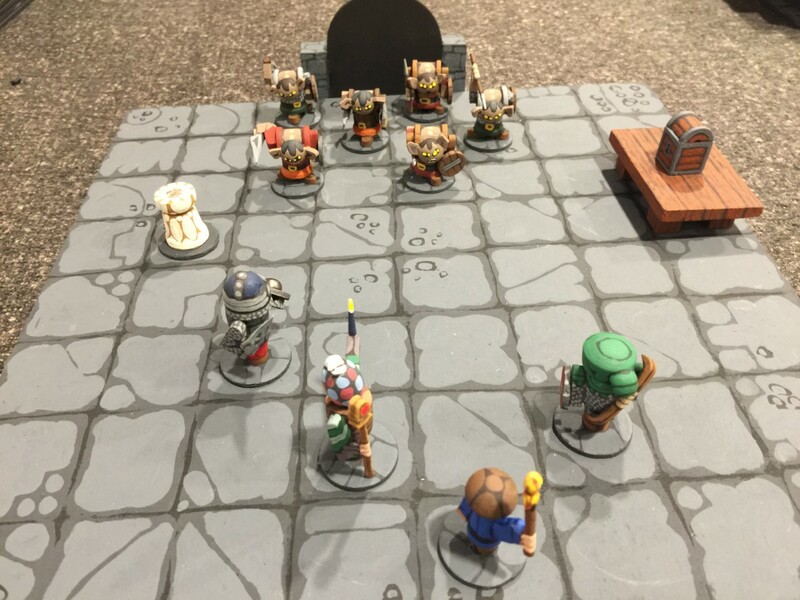 Because these figures – although they will continue to have multiple figures per base – they will be spaced much farther apart and thus all details will be easier to see by the game. 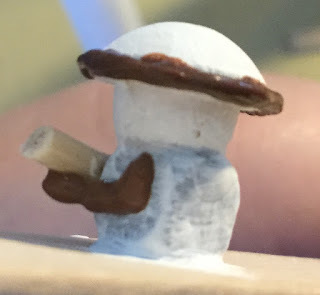 Although I will not be painting a lot more details than previously, those details I do paint will have to be made consistently on all figures. For that reason I have switched to painting all figures separately, off of their bases. Next, I glue the furniture (screwhole) plug to the top of the cube bead. For those that don't know what I mean by furniture plug, you can see them in the picture below, highlighted by the red rectangles. These are small wooden parts that are pressed into the holes where you screw furniture parts together. They come in various forms, such as flathead, roundhead, and mushroom or button plugs. As you can see, the button plugs look like the old 'pie plate' helmets used by the British and Americans in WWI and the British in WWII. (The Americans still used them in 1941, but they were replaced in 1942 with the helmets we are all familiar with.) Because they look so much like them, they make a great starting place for these helmets. 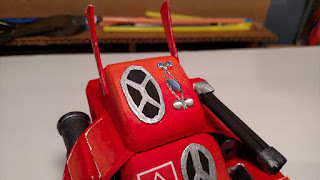 As I noted in an earlier post, I think that the headgear is probably the single most iconic piece gear when it comes to identifying what a miniature represents. Get this right and you are a long way towards having figures you are happy with. I would recommend a small dab of superglue (I like the new Gorilla Glue Superglue Gel) on one piece and a small dab of white glue on the other. The water in the white glue will help the superglue set faster. Another stock of the trade is a flat toothpick. In case you are unsure of what I mean by that, it is shown in the picture below. It has a blunt point on one end and is rounded on the other. These are not usually found in grocery stores anymore, but can be found in the craft stores like Hobby Lobby and Michael's. Note that Peter Pig's Poor Bloody Infantry (PBI) uses casualty markers. To be honest, I always thought casualty markers were a complete waste of money and time. I simply use red glass beads for this sort of thing. But given that these figures are so inexpensive to produce and quick to build and paint, I decided to splurge. These are the start of those markers. Note the 'imperfect' placement of the feet. I am also going to build a .30 caliber Browning machine gun team. Almost every picture I see has the gunner sitting upright behind it and the loading lying or kneeling to the left. I decide to put some 'feet' in front of the gunner and behind the loader. In hindsight, I should probably have put some 'knees' between the 'body' and the 'feet' of the gunner. Who know? Maybe later. As my wife will tell you, I don't get rid of the scraps because I will always find a use for them eventually. I use the pointed end of the flat toothpick for the casualties' arms. I normally don't do that for normal infantry (which I will show later), but these seem perfect for casualties. I am not using two arms for every figure. I am not trying to be morbid, I am just assuming that some casualties will have arms folded under them, at their sides, and such. Arms at the side of the figure are pretty easy to make, but arms sticking straight out, like with the gunner and loader, is much harder with my normal method. I will use the toothpick stick for these figures also. Ignore the excess white glue. It will shrink when it dries. What I normally use for details is a product called E6000 Allure Dimensional Adhesive Paint. It is a thick, glossy, plastic goop that will set in about 15 minutes and harden overnight. 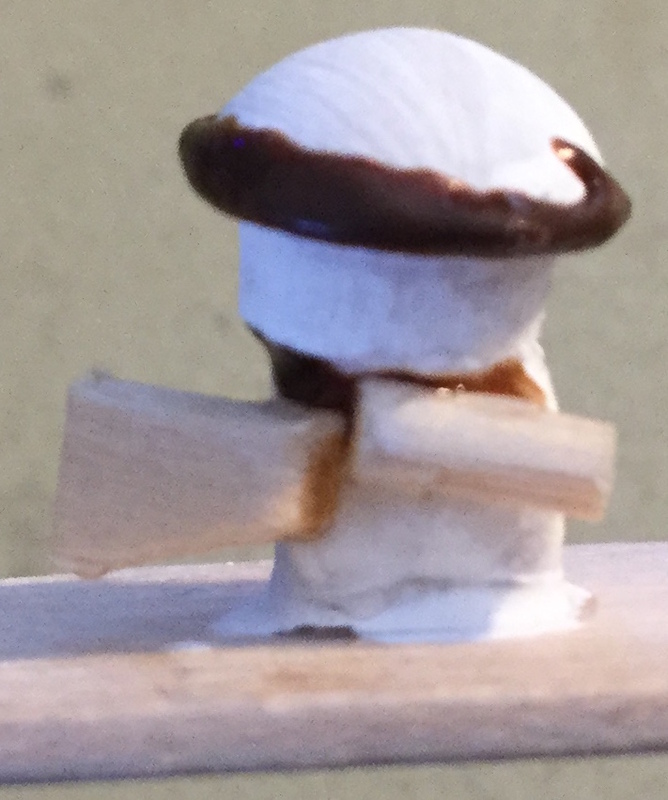 To the business end I attach a fine applicator tip so I can place a finer bead of goop to the figure. I have applied white gesso to the figure so that it is easier to see the goop. 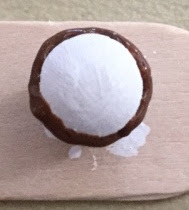 I apply a thin bead to the bottom outer edge of the 'helmet' to make the rim. Note that the idea of getting a thin bead is thin measuring top to bottom. The goal, however, is to make the brim expand outwards more prominently. The image below left is what you want while the image below right is not. The latter just won't show after being painted. Everything about figures in smaller scales has to scream exaggeration. If the figures are not 'cartoony', then it is probably too subtle. If you don't like that style, you will probably not like the results of the figures as they will probably be colored blobs to you when looking at them at arm's length. Of course, you don't want every detail exaggerated. You need to pick and choose which details get highlighted and which are not necessary. For me, the headgear is what the eye of the gamer sees the most, whether viewed from behind (the figures you are using) or from across the table (the figures your opponent is using). Now it is time to start making weapons. I used a piece of flat toothpick and the snips (above) to make the stock, receiver and magazine for the BAR and a piece of dowel for the barrel. I do the same for the NCOs armed with the Thompson submachine guns. 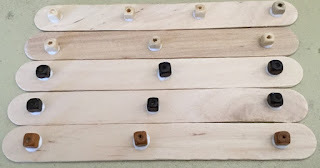 Don't worry about the gaps as that will be filled in with good, glue or paint. 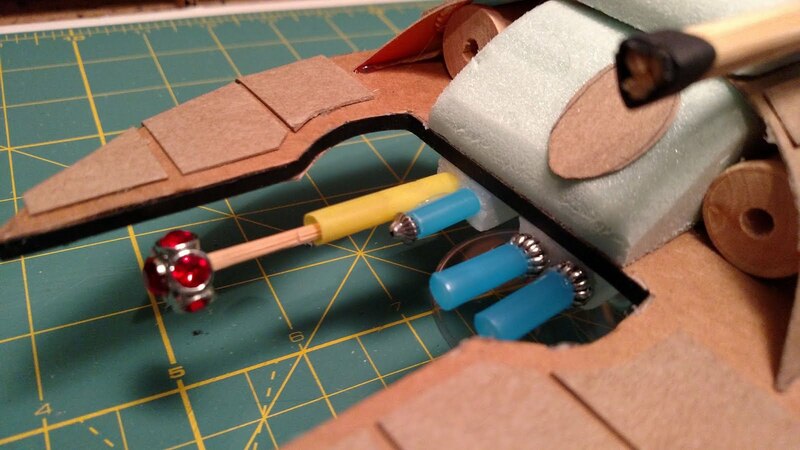 Glue a length of dowel to the chest of the riflemen. 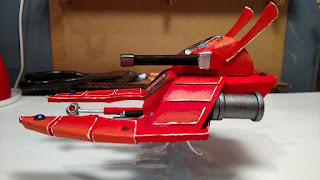 Put it at an angle so that the right 'arm' will drape over the weapon while the left 'arm' will come up under it. A few wood scraps for the loader of the Browning .30 cal machinegun to represent the ammo box and belt. Time to start 'making' the 'arms'. 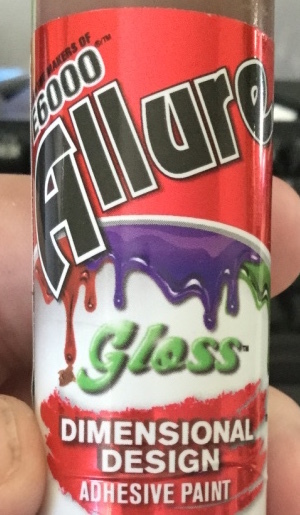 More E6000 Allure goop. Two little blobs to show where the hands will be. Do all of the figures this way first, so that by the time you come back to do the next steps, the goop for the hands will have started to cure. 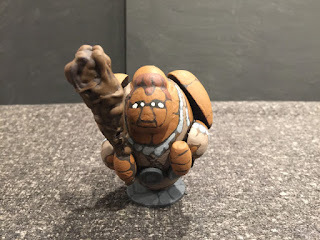 Making the arm is as simple as painting a bead on the figure. Here the right arm is draped over the stock of the rifle, gripping the trigger area. Again, do all the right arms before moving on. It is so easy to brush across the uncured goop and have it ruin your work so it is best to do one step at a time. Now paint the left arm on with the good. This is easy, easy, easy and quick. Guess what? We are done with construction. Unless there is some extra detail you want to put on, like blobs for cartridge boxes, haversacks or gas masks, that is all you need. Me, I am stopping here. I am not going to show a step-by-step progression of the figures, but simply go over the paints I used and the order. 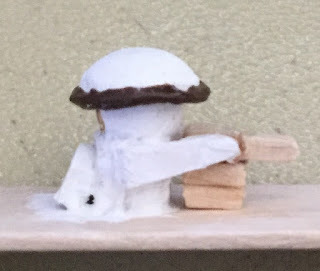 I applied white gesso on those parts of the figure that were added after applying the gesso initially. Normally I apply it once, at the end, but I thought it might help you see the bits added during the build if I painted the core figure white at the start. Gesso is important when using unfinished wood as it helps clog the pores in the wood so it does not soak up so much paint, giving it a dull color. On beads that are painted, or are plastic, gesso helps the paint stick better to the material. The E6000 is also very glossy and plastic, so the gesso is almost necessary in order to get paint to adhere. I painted the helmet with Evergreen craft paint, mostly to cover the white and give a dark base. I then dry-brushed Vallejo Reflective Green on top. This allowed the rim of the helmet to pop and gave the appropriate battle-worn patchy look. The main uniform is Ceramcoat Khaki craft paint. I usually use old Citadel paints or Vallejo paints for large areas, so this was an experiment to use cheap craft paint. It took 2 1/2 coats, but I am very satisfied with the color. I use a medium brown color – Citadel Vermin Brown, which is now Games Workshop Skrag Brown – to paint a band of hair on the figure. I used to paint the hair so that it fell above the next, leaving a thin ribbon of flesh. Not this time. I also used to paint the hair around where the ears would be. This time I decided to paint a 'wall' of hair and add the flesh back in to break it up. Next came the flesh color. I used the old Citadel Tallarn Flesh, which is now the Games Workshop Cadian Fleshtone. Basically I just painted the face and hands with the larger brush, then painted a dot for the ears and a line to make a little bit of exposed neck under the ears. This method was much faster and viewed from the tabletop, produces the same result. The rifle was painted using Games Workshop Dryad Bark. 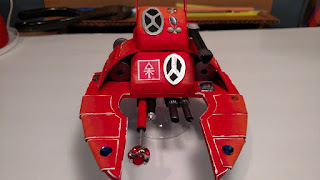 The end of the rifle and the bolt mechanism got spots with Games Workshop Leadbelcher (Citadel Boltgun Metal). Finally I finished the figure off by painting the eyes and mouth. Actually, I used a fine pen for the mouth. I used that same pen to put lines around the arms to give it better definition, as all that khaki just blended together. All in all, I am very happy with the figures. 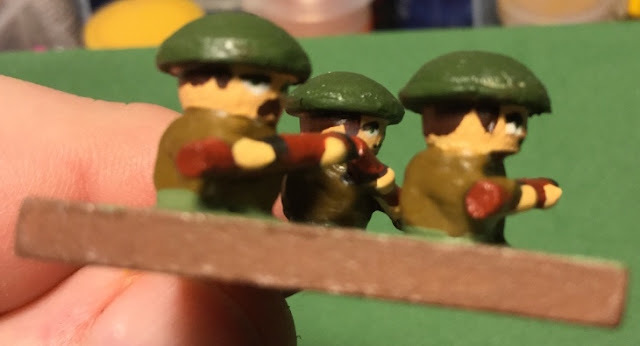 I am still putting the finishing touches on the platoon leaders with their Thompson submachine guns, the BAR teams, and the .30 cal machinegun team. I haven't built the Browning .30 cal either, as that will be built after the figures are painted. 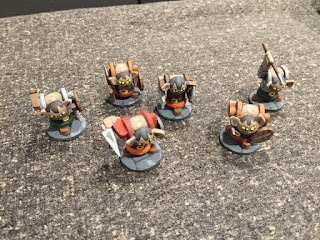 I've been busy doing some Mage Knight figure repaints for my D&D game, but I worked extra hard this week on them so that I could get to the Craftee goblins I've been wanting to do as well. 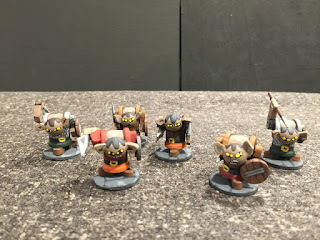 As I said in an earlier post on the Skaven, I've always wanted to do hunched over goblin figures and I've never been happy with any of the probably six different constructions I have tried. I think I'm finally happy with the design for the ones I finished tonight. I should go to bed, but I wanted to do this post before turning in. I am now convinced of several things. First, the addition of the feet to some of the monsters really matters. 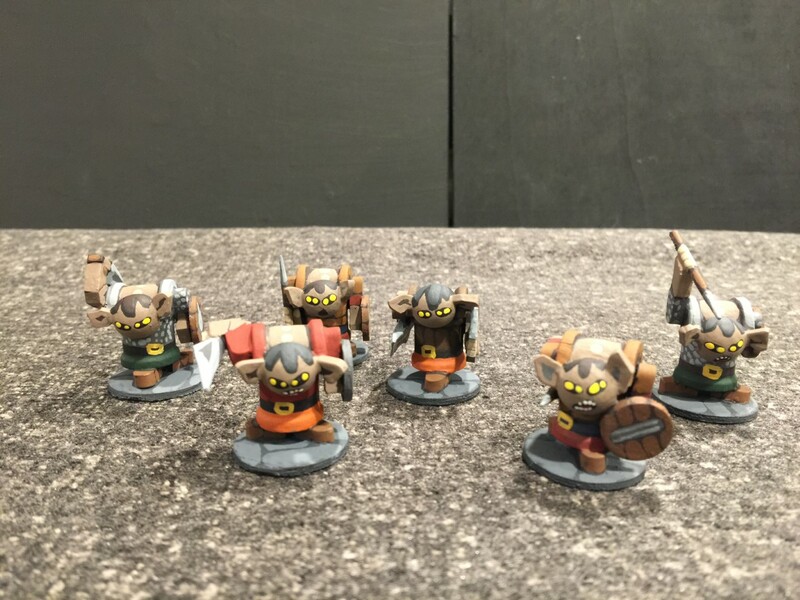 These goblins look so much better with the tile spacer feet than without. Second, and more importantly, I dig these little guys! It's so easy to make goblins that just look ... well ... wimpy. These guys look like the last fellows I would want to run into in a dark dungeon hallway! The body was essentially the same as for the Skaven. 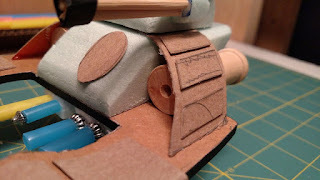 1/2" x 1/2" spool with a split spool glued on the top, flat side down, to make the "shoulders." 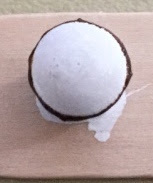 The head is a split bead. 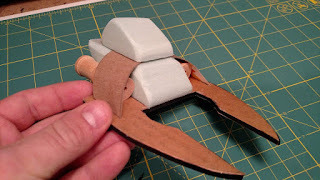 Tile spacer arms and feet (and weapons in the case of the blades). The shield is the usual small precut thin wooden piece, and the spears are toothpicks. The ears are tile spacers cut to shape. 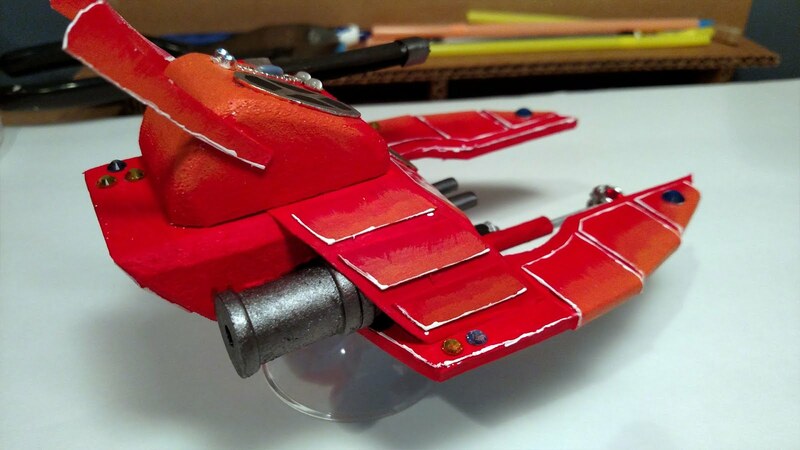 Really easy to make and paint. Now for some action shots! 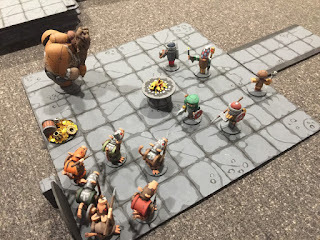 Just as our small adventuring party with hireling torch bearer was about to investigate the chest on the table, an angry group of goblins streams forth from the dark hallway opposite the adventurers intent on ridding their underground home of these surface-dwelling interlopers! I didn't want to paint the goblins green ... I almost painted them yellow ... but instead I decided I wanted to use some color that was neutral, but would also give a nice "washed out" look. I considered several different shades of gray, but that is sort of a "cop out" for these figures, I think. But they do need to have a neutral skin tone and they need to look washed out. After all, these guys are not exactly soaking up the sunlight every day! There is a craft paint color called "Mississippi Mud" which I thought was perfect. I'm happy with this choice for the goblin's flesh, although I might do some greenish or yellowish ones in the future for variation. Next up, goblin archers! 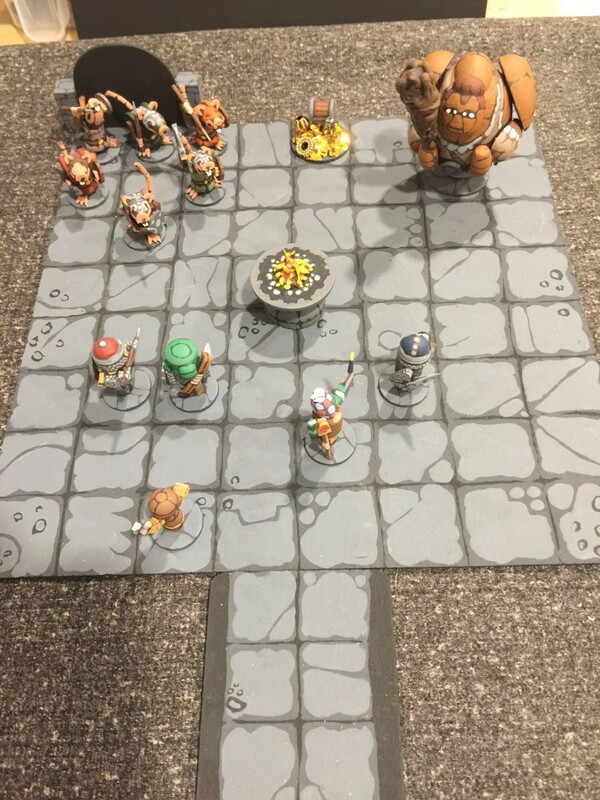 I need to put on a Mine of Moria Lord of the Rings Fantasy Battles Game for my gaming group when I get enough goblins done! I am getting to the point where I usually hate to rebase my troops. If I decide to work in my smaller scale, using beads for troops and using a minimalist design, I can construct, paint and base these troops in about the same time that I can rebase traditional metal or plastic soldiers, basing them in a 'realistic' scheme using glue, sand, gravel, flock and paint. 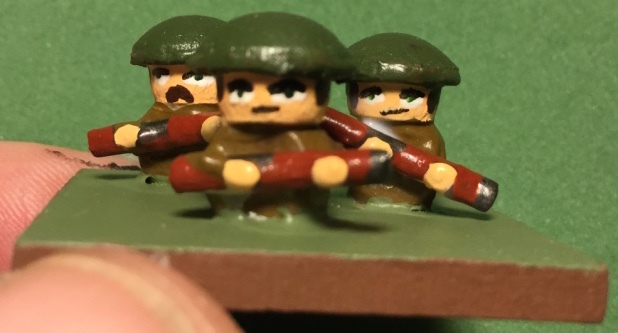 (If the troops were fixed to the base using epoxy, I might not even be able to rebase the figures.) Some of the troops I have, especially those painted and based by professionals, I could never replicate the look, so I really don't want to take them off their bases in the first place. So, if I want to try a new set of rules for a period where I already have figures, but they are not based correctly, I have either converted the rules to use the basing scheme that I already have, or I simply set the rules aside to collect dust. One of those sets of rules were Peter Pig's Poor Bloody Infantry (PBI). Although people say that you can use troops that are based for Flames of War, it involves a bit of conversion, which I am not going to get into. So for years I have simply set aside those rules. 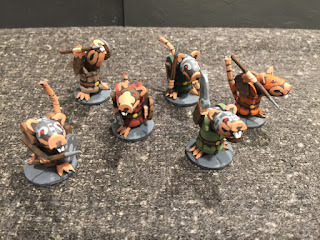 When a new version of PBI came out I resisted the urge to buy them, as I had not played the original version in all these years and I found out that the basing scheme was essentially the same, so why bother. I would still have the same issues. 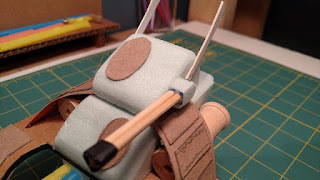 Now that I am on the tail end of my Seven Weeks' War project – I am finishing the last limbers and expanding my cavalry units from four and five figures each to six figures each – I started thinking about a new project. Mind you I still have other projects in the works, such as the Spanish 1808 and the 25mm DBA Hun army, but still, I wanted a minimalist bead army project. That and I wanted to create new figures in new periods, as that seems to be what I enjoy the most. I like to see what I can create. 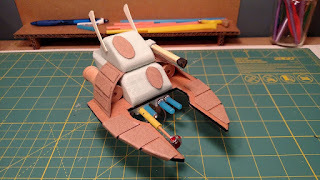 Having looked at Wyloch's Armory's work (see previous blog post) and being inspired about the possibility of creating simple vehicles from wood and plastic I decided to go for WWII, and specifically to finally build forces to give PBI a go. 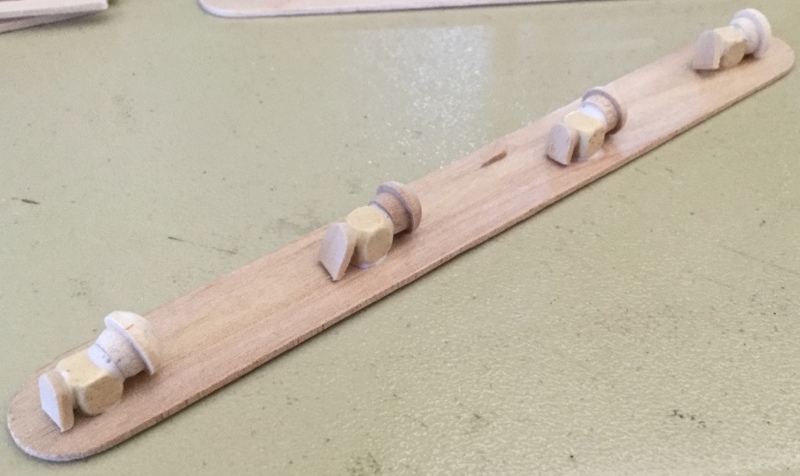 As I have never built a British force in Flames of War and because the British seemed relatively simple to create with button plugs, I decided to start with them. 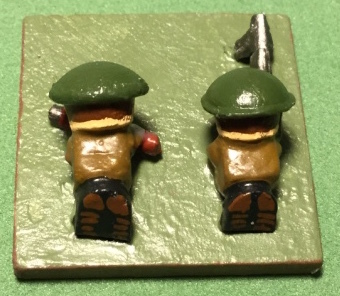 The British infantry consists of two main pieces: a screw hole furniture plug with a button (or mushroom) top and a cube bead. In this scale the plug is 1/4" and the bead is 6-8mm. 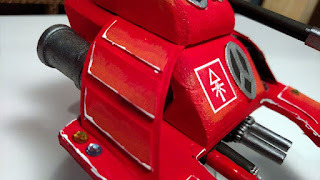 The rifle is a simple miniature dowel and I used Allure dimensional adhesive paint (see previous blog post) to create the arms and hands. Note that these plugs are the same ones I used for my 1866 Prussians. In order to make it a little more 'pie plate' looking, I put a thin bead around the edge of the 'helmet'. 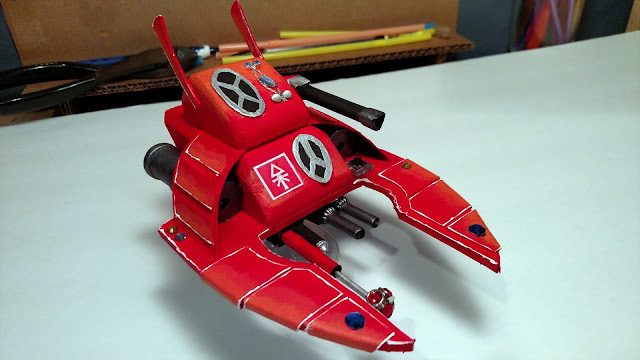 Very simple to build, very quick to paint and very easy to base. Next up I wanted to try a Bren gun team. I wanted these troops to be prone, however. If you look at the edge of the gunner's helmet, you can see that I did a better job with his helmet than with the others. The trick is to lay down the thinnest bead you can along the bottom edge. The Bren gun itself is made of the mini dowel and two small scraps of wood. The first one goes on top and represents the magazine with the rounds. 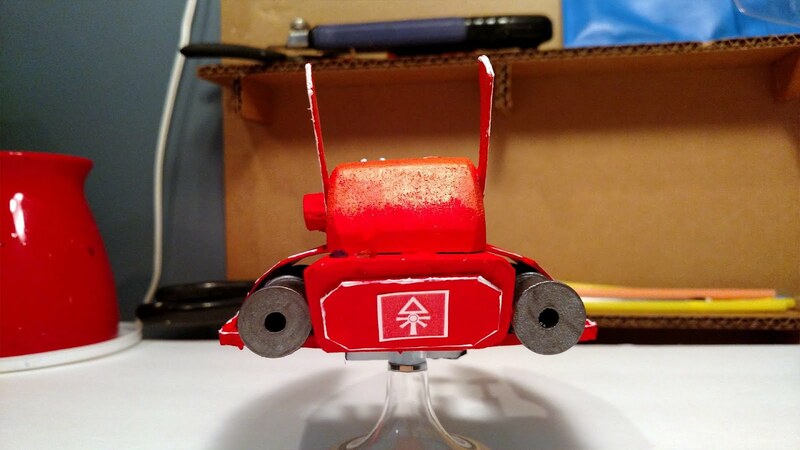 The second scrap was glued under the barrel and then cut into a '^' shape to represent the gun's bipod. I simply painted the empty space black. This is minimalist after all! I have to admit, the part that makes me smile was painting the bottom of their boots with mud. 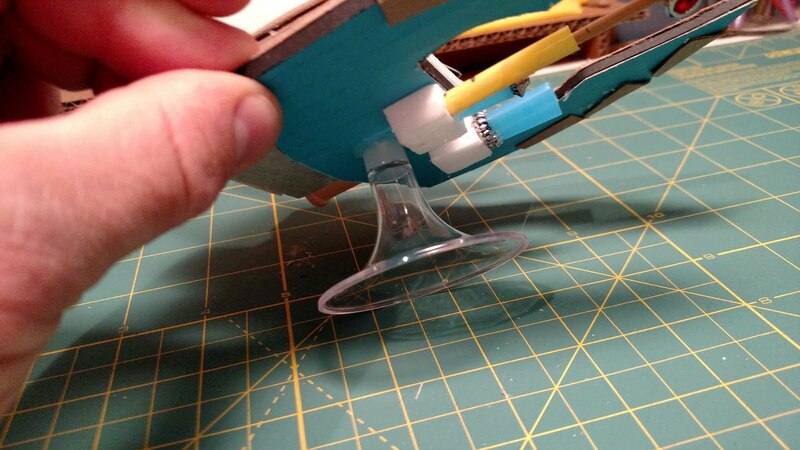 The boots are simply the rounded top of a flat toothpick, which I use for all sorts of parts. I am still thinking about who I should choose to oppose them with. 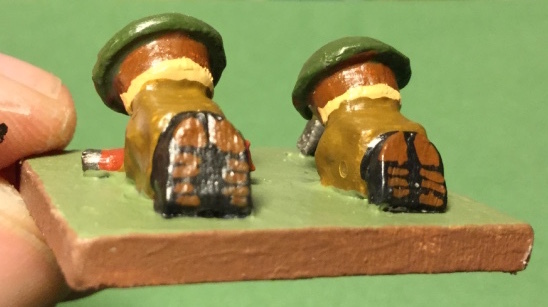 I did some prototype Germans, which I will probably show when they are finished, but given that I have nice German Grenadier and Panzergrenadier forces based for Flames of War I was really thinking about trying something else. I have some prototype German Fallschirmjagers being built, but if I did forces for the Battle for Crete then the British should be in a different uniform (I believe). But it could easily fit in France 1944 where they could fight the British or Canadians. My next thought was doing the German Gebirgsjagers (mountain troops), which fought in Italy 1944. Once I started looking into them I found that the fought the French, Americans, and Poles. So these 'British' troops could actually be Poles. That might be interesting. I might have to look a little closer into that. Finally, I thought about the Italians. Of course, the thing that leaps to mind the quickest is the Desert War, but I had not painted the troops for the 8th Army in the desert gear. So that probably meant fighting them in smaller campaigns (the Balkans?) or in Sicily or even hold-outs in Italy 1944. The funny thing is, Battlefront produced those books for Flames of War after I stopped buying their stuff, so I don't have any of that as reference. For a tank, it will really depend upon what period I end up with. I was strongly considering doing a Matilda, just because I have nothing like that, but that would really mean France 1940 or Desert War 1941. Decisions, decisions. WWII really is a huge subject because it covers so many theater and rapid technology changes. I will figure it out though and let you see the results. Honestly, a driving factor in this will, as always, be the 'hats' and 'helmets'. I have long ago determined that with model soldiers the singular piece of gear that is iconic, and helps a player determine what he is looking at, is the headgear. 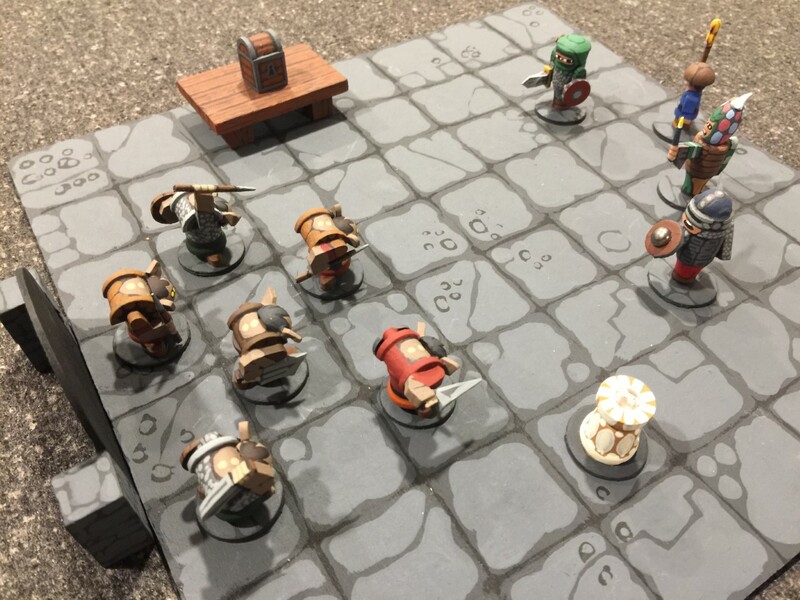 Having to create custom shapes with putty or dimensional paint is okay for two or three figures, but is a pain when the numbers are approaching 50 figures. Run for your life! 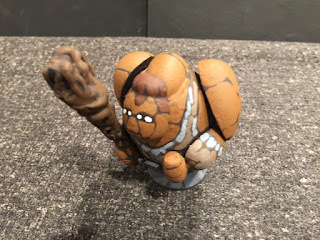 A hill giant is coming! I thought I would hit you with the pictures first, before going on and on about the figure and eventually sounding like Charlie Brown's teacher. So, this figure is a hill giant. 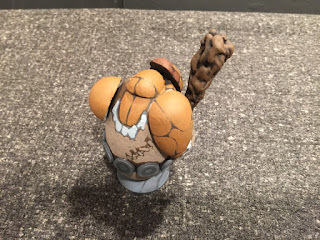 He (or she) is made out of a pretty big egg for a body, with medium sized split eggs for upper arms, small robin sized split eggs for forearms, and the quickly becoming ubiquitous tapered beads for hands. 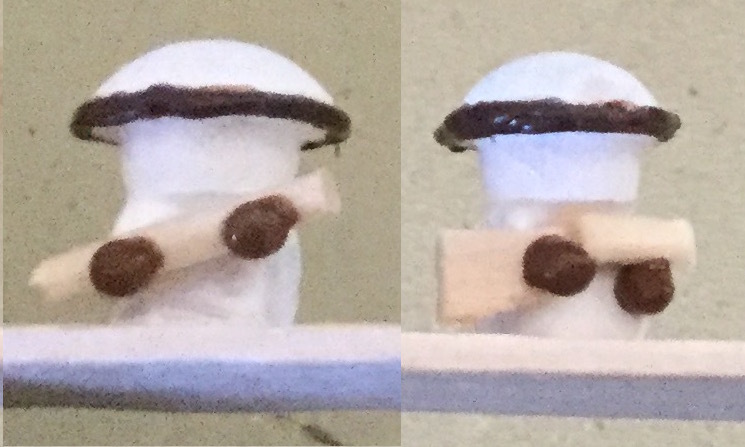 The head is a split lady bug, the hunch in the upper back is another split robin egg, and the belt is just a bunch of the small wooden precut thin wood discs that I get at the craft store glued around the "waist" of the figure. The only really "new" construction here is the club. 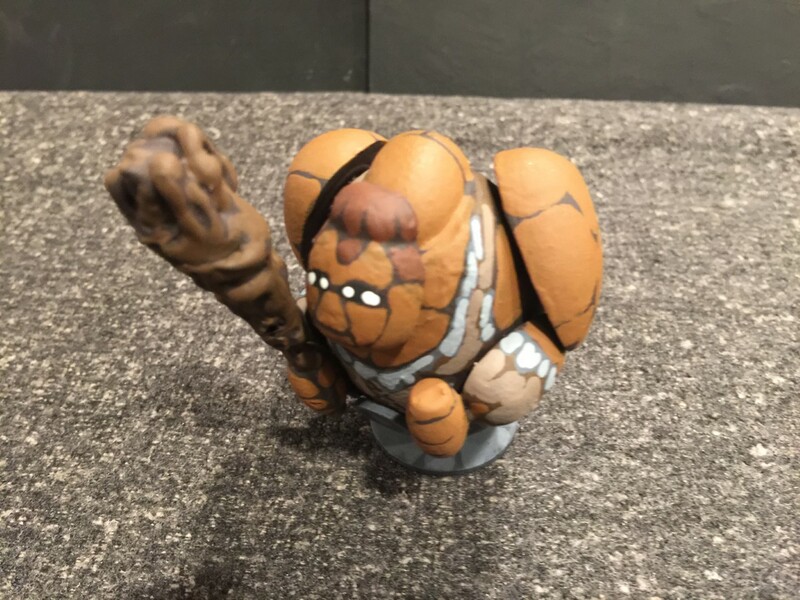 What is a hill giant without either a club or a rock? 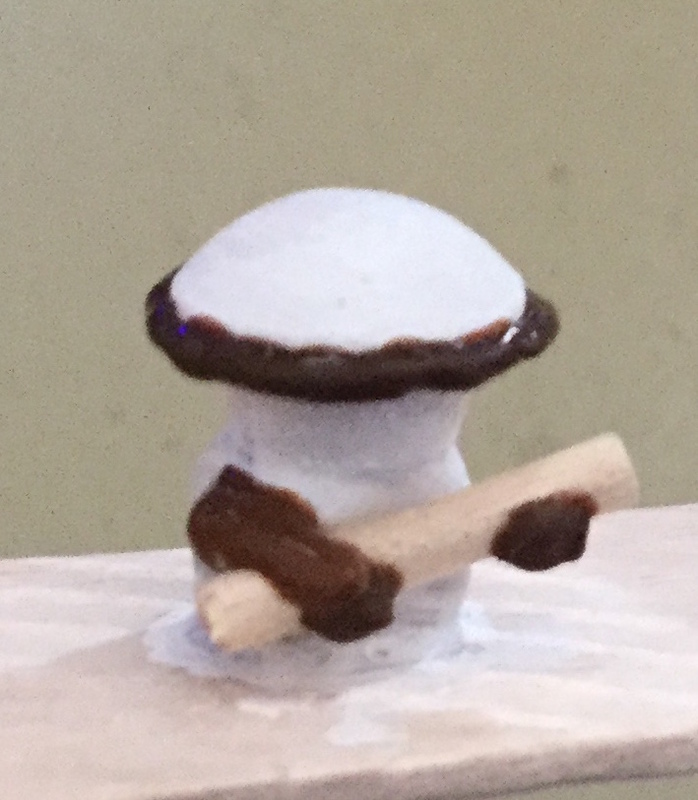 I didn't want to do a rock, I wanted the figure to be holding a club. But how to do this? I will admit, next to many of the other crafter types out there, I'm not a hot glue gun fan. I have a really hard time controlling where the glue goes when I use a hot glue gun (I even got one of those small ones with the needle tip ... still have trouble), without fail I burn my fingers at some point, etc. But for making a rough wood club, I am very happy with the result I got with the glue gun. It turned out to be very easy. I started with a Q-tip and cut one end off. The end with the cotton is at the top of the club. 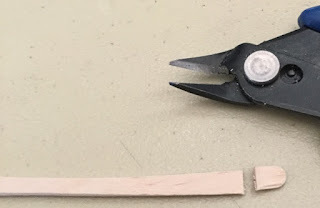 Then I took the glue gun and just kept applying hot glue to it, tapering it larger at the end and smaller as I got closer to the "handle" of the club until I got a shape I liked. 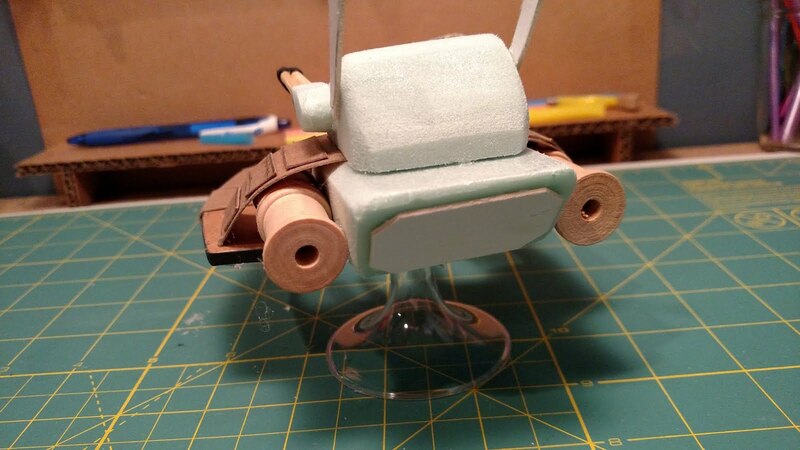 I did not go all the way to the end with the hot glue at this point. 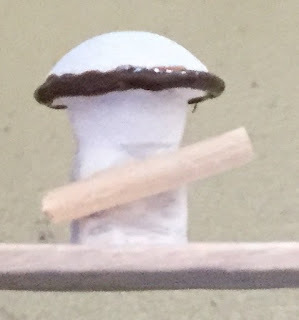 That handle end has to fit into the tapered bead hand, and hot glue on the end of the Q-tip would likely keep it from fitting into the hole. 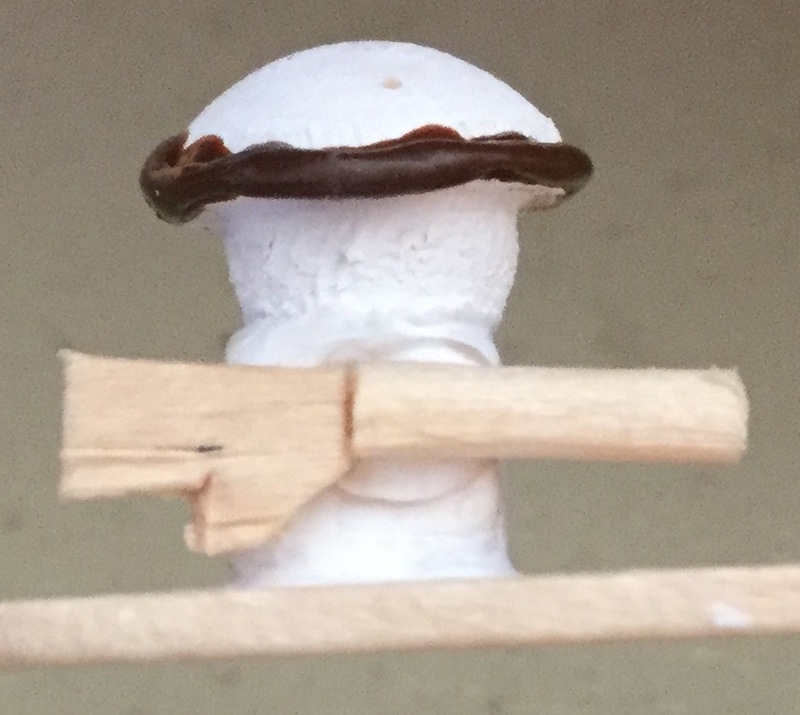 When I got the shape I liked, I put a little hot glue into the hole of the tapered bead and slid the club into it, thereby gluing it in place. 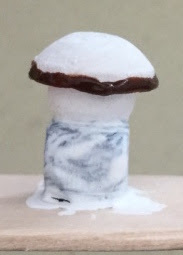 The beauty is that if you get a little glue poking out the top or bottom of the bead, it looks great and it makes for a better seal. Then I put a little more hot glue on the bottom of the part that is sticking out the bottom of the hand. Done! Painting wasn't difficult. I wanted to choose a color for the creature's flesh that was somewhat "dirt" looking. For the clothes I got inspiration from a drawing I found online. 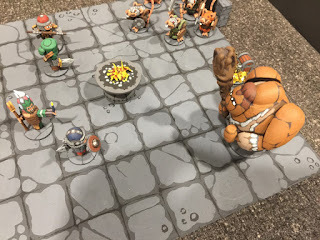 My favorite monsters from that really expensive company that makes beautiful miniatures ($40 for one ogre figure!!!) 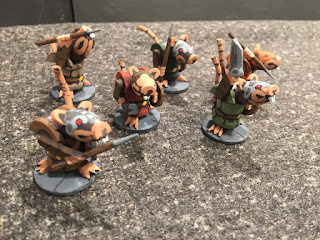 are the rat-men or Skaven. I've been pondering about how to do a Craftee version and I finally think I hit on the solution. One of the ironies here is that for about two years I've been trying to come up with a slumped over goblin shape that I like, and I have yet to find it. I literally have done 5 or 6 different goblin constructions, and I honestly don't really like any of them. 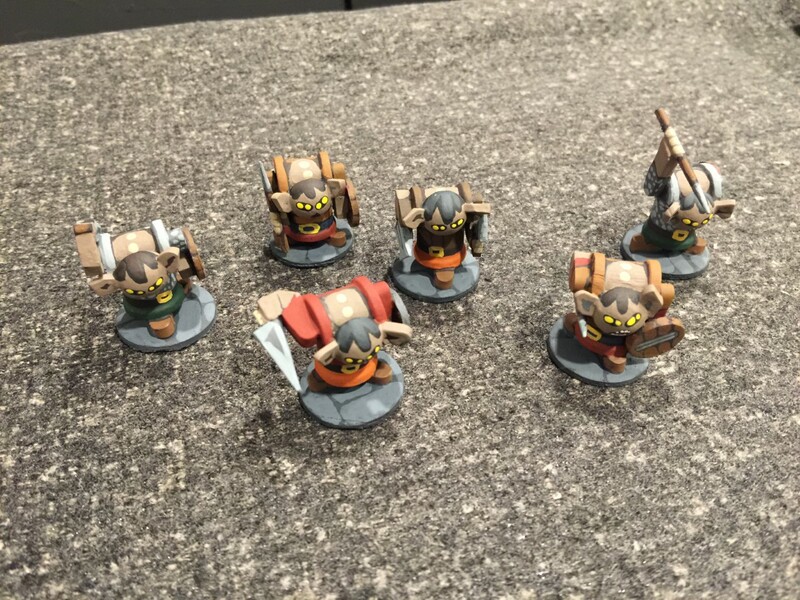 I don't even like the goblins that much that I did for this current group of fantasy figures that I have. 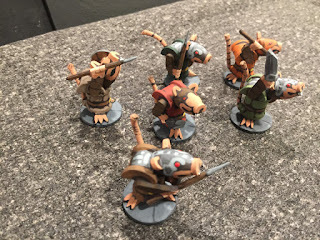 Well, this construction for the Skaven, with a different head, would probably finally give me the hunched over goblin look that I've been after for years ... but that's for another post. I am pretty happy with how they turned out, but I'm not going to lie. In terms of my Craftee pieces which I try to be as minimalistic as I can, there are a lot of parts to these guys. 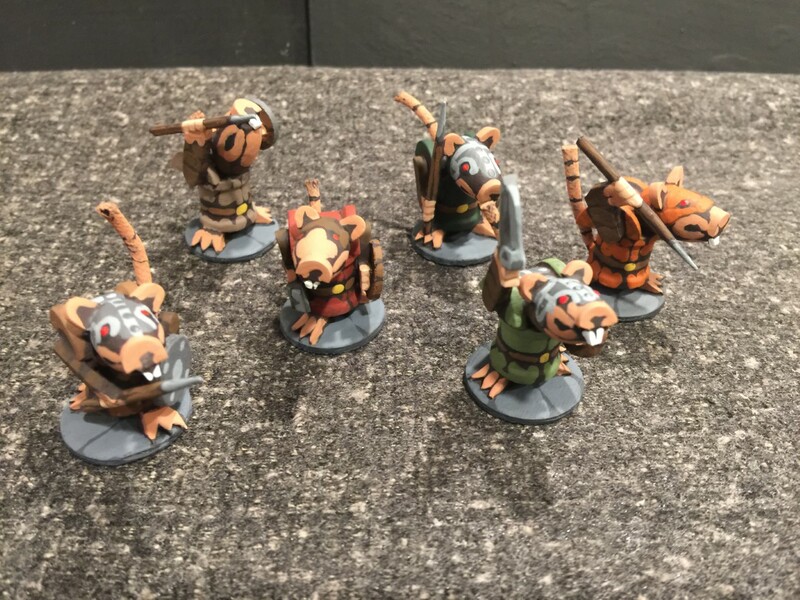 Who knew that little rat men would require so many different pieces! The basic shape, however, is simple. It's a 1/2" x 1/2" spool with a split spool glued on top flat side's together. This creates the hunched over shoulder look that I like so much. Yep, two years later, I finally stumble upon this incredibly simple, yet effective, construction. The head is ... yep, you guessed it ... a tapered bead. So far so good, not bad at all. But everything else, except the toothpick or tile spacer weapons and small round wooden shields are cut tile spacers. The arms are the usual tile spacers but these figures are supposed to be a bit on the skinny side (rats have sort of thin limbs after all) so they are about 66% thick tile spacers (thinner than usual arms). The feet, which turned out to be key, I need to put more feet on my miniatures I think, at least the monsters, are cut tile spacers. From the middle of the foot towards the toes I cut it at a 45 degree angle to give a tapered foot look. You can't really see it in the pictures, but in real life it really makes a difference. The ears are tile spacer ends (very tough to glue on I'll be honest), and the nose/teeth is a tile spacer end cut so that the bottom teeth part is thinner than the top nose part to make it appear that the end of it's nose/lips are sticking over the teeth themselves. Finally, the tail is a stiff craft cord that I got in the leather crafts part of the store. You could use any string here, but if you use something thinner, I suggest after gluing it in place, you coat it with white glue and shape the tail how you want it. 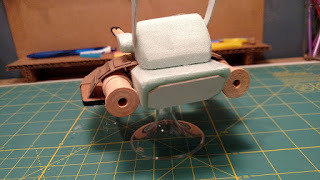 After the glue dries, it will more or less take on that shape. I used a hot glue gun to attach the tail, putting some glue in the hole in the spool on the bottom between the feet of the miniature and sticking one end of the cord in the hole. Once the glue dried I put another small dot on the cord and pressed it up against the spool at the bottom to create the "curl up" effect of the tail. You know me, I can't resist action shots! Our intrepid adventurers have stumbled into a room with some nice loot on the far side, but it seems to be guarded by a hill giant (don't ask why a hill giant would be in the depths of a dungeon ... just go with it). 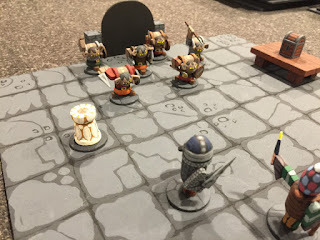 Also, Skaven have heard the adventurers and have rushed down their dark tunnel to arrive in the room to fend off the party as well. 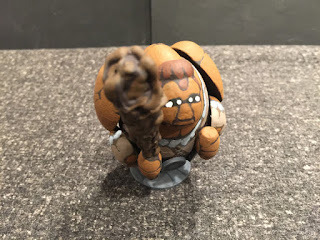 Hope you enjoy looking at the pictures as much as I enjoyed making the figures! 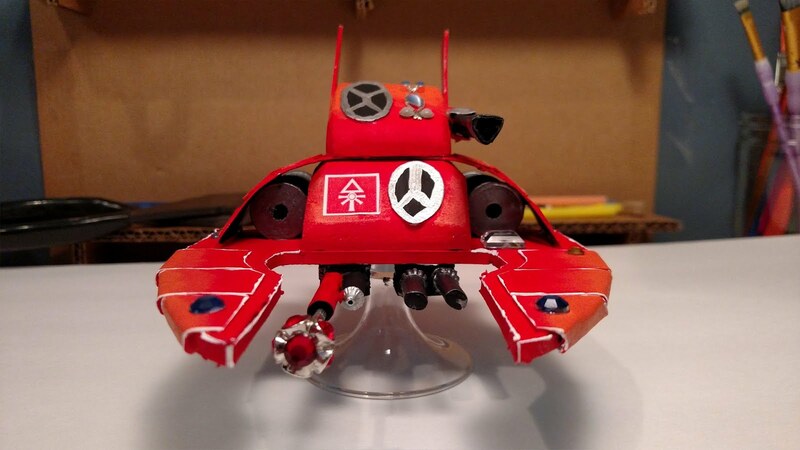 Disclaimer: all pictures in this post are not done by, or of work by Matt or I. I am showcasing the work of Wyloch's Armory. I am using their pictures with the permission from them. One of the reasons why I have never delved too heavily into the modern subjects has simply been vehicles. Sooner or later, no matter how much you tell yourself that you will only limit yourself to infantry for skirmishes, you inevitably, eventually, want to include vehicles (along with cavalry, artillery, plus machine guns and other modern weapons of war). Vehicles are hard. They are complex shapes, many of which are curves. Although people scratchbuild them, they are typically made out of paper or wood, but they wood ones are very intricate. Much more than I want to do. 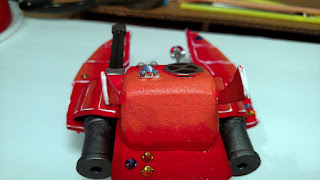 I am not a model maker, after all, but a miniature builder. Well, then I saw the Wyloch's Armory build of a not-Eldar Falcon on Facebook. Now that is a lot of curves! And because I saw it before it was painted, I could see the parts used to make it. Many of them are parts that I already use in my miniatures making. 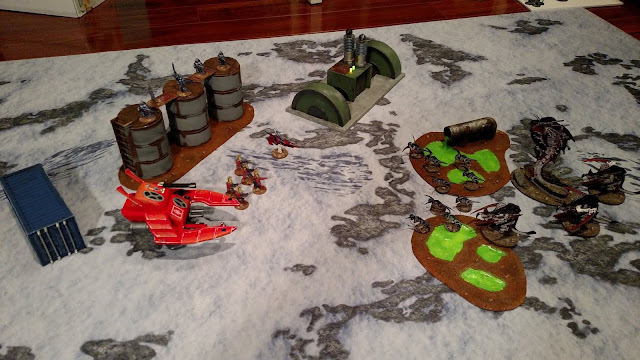 Let's start with a picture of a game, not-Eldars versus not-Tyranids. You have to look closely, but those miniatures are all paper flats. 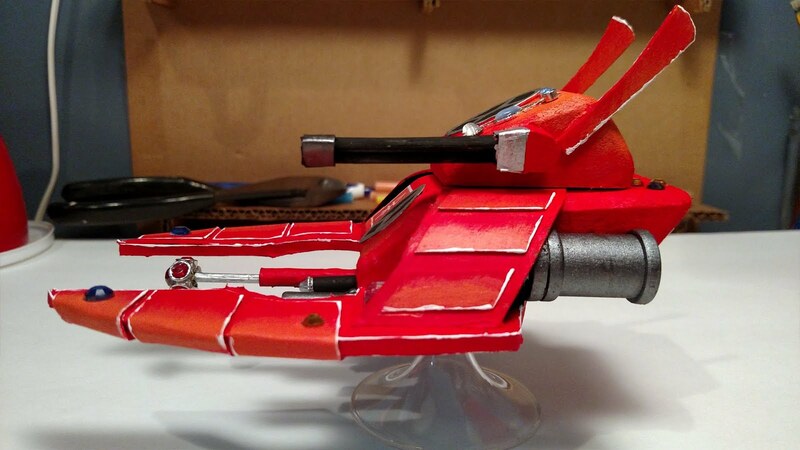 And that Falcon is scratchbuilt. I will let the build pictures do the talking. 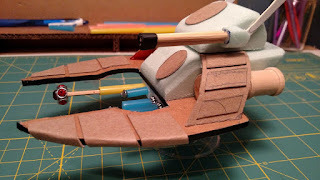 As best as I can tell, he took corrugated cardboard to make the basic 'winged' shape of Falcon, then took two blocks of balsa wood to make the shape of the hull. 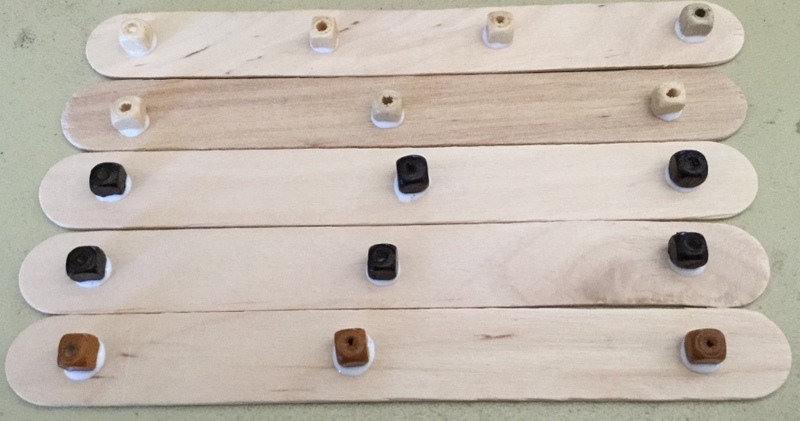 Spools define the engines, and bits of shaped wood define the 'flair'. 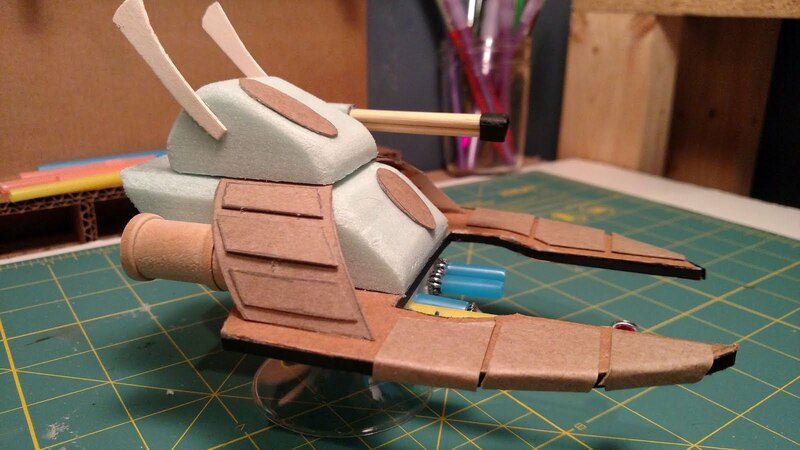 The curved, upside-down 'U' that attaches the 'wings' to the hull is chipboard (cardboard like you find at the back of a notepad). Some of the other shapes are also chipboard. The weaponry consists largely of either wooden dowels or plastic soda straws filled with hot glue. Beads make up the various 'electronic components' for the weaponry. Wyloch's Armoury also has a Youtube channel which has more not-Games Workshop 40,000 items (like a not-Rhino), but crafting for RPGs, along the lines of DM Scotty and DMGinfo.